interest you may save with different balance transfer credit cards. What does this calculator perform? This balance transfer savings tool calculates your current credit card information entered in the form, and finds offers that can save you money. Tables are based upon a 24 month period. You will have the new card for at least 24 months. You will make the monthly payment specified. 100% of your old credit card balances are transferred to your new card. Annual, overdraft, maintenance, balance transfer, or any other fees. Interest rate changes or adjustments, such as a default rate or variable rate change. Other APR's, such as a cash advance and default APR's. 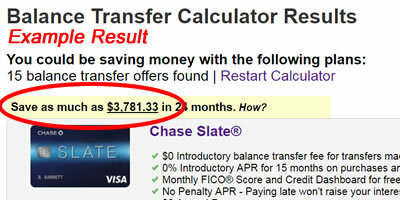 The introductory and standard APR calculated for the new card offer may vary among applicants. Depending on the issuing bank, applicants may be issued rates depending upon specific credit qualifications, in accordance to their summary of credit terms or credit disclosure. Not every applicant will receive the same APR for a card, so the savings may vary. Do I have to register or commit to anything by using this program? No. You can use this program as often as you wish free of charge. Are you considering a credit card balance transfer? Before you make a final decision, it's important to calculate your potential savings. With the help of a balance transfer calculator, you'll soon understand how much money you can save by completing this transaction. Identify your current balance and interest rate. Compare offers to find the best one for your financial situation. Note: Don't forget that most balance transfers are accompanied by a fee, typically in the two to three percent range. After running the appropriate numbers through our calculator, you should have a better feel as to how much money you can save by completing a credit card balance transfer. Only then can you decide which steps to take next.